Our suggestion to make you enjoy the guided Tour of “Tapas and Taverns” in Old Madrid, represents a unique experience to discover the essence of our customs and our historical, cultural heritage. In these singular surroundings, you will also be able to feel the excitement of the typical local gastronomy, just in the same way as Madrid´s inhabitants do: “Los Madrileños”. It is without any doubt, one of the best entertainment offers in Madrid. Expert Guides from Madrid “Tapas and Taverns” will give you easier access to this universe of feelings and, thanks to their careful service, an unforgettable experience will be created for you. This exclusive opportunity to enjoy your stay in Madrid, will also let you acquire an historical knowledge and a general view of the emblematic places in the so called “Barrio de los Austrias” and of the Royal Palace surroundings. Approximate length: 180 minutes. (On foot) (Time spent in the Taverns is included). 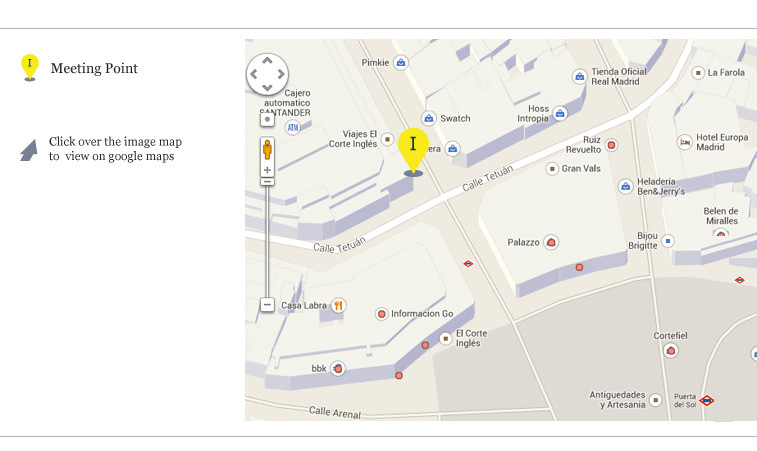 Starting Point: “Puerta del Sol” Square, (Underground: “Vodafone – Sol”). Finishing Point: “Isabel II” Square. (Underground: “Opera”). Meeting Point: Main entrance “ El Corte Inglés”. 3, Preciados Street. Personalized service in four selected typical Taverns. Taste of a “tapa” and a glass of wine (option: beer, sangría or soft drink) in each of the four selected taverns of the arranged tour. Program: Every day of the week. Maximum number of participants per group: 12 people. Minimum number of participants per group: 6 people. Price: 69 € per person (everything included). Bookings from 6 to 12 people in a tour : 10% discount per person. The group will be accompanied by a guide during the whole tour. Among other functions, the guide will have the task of giving users instructions which the latter are committed to follow for the sake of the best organization of the tour. The group will be formed and closed at the meeting point 15 minutes before the arranged timetable for the beginning of the visit. A user´s absence at the given time and place, may lead to exclusion without the right to get the booking deposit back. The Tour Organization reserves the right to modify the arranged route, for justified reasons, without taking on any obligation on its behalf. T&T does not assume any responsibility in relation to possible incidents and accidents that may happen during the tour as a result of a user´s negligence, particularly, those concerning lost or theft of the user´s personal belongings. In the event of a tour cancellation due to causes outside the customer, the latter will have the right to a change of booking concerning date or timetable, or to a refund of the money already paid for. Under no circumstances, is compensation for cancellation considered. In the case a customer requests an extra service (not included in the tour), the latter will be responsible for the expenses. Any customer who asks for a change in his booking related to date or timetable, must inform via e-mail 48 hours in advance. T & T will confirm this request to the customer, providing there are vacancies available in the requested tour. 48 hours before the start of the tour: partial refund: charges 15 € per person. 48 hours after the start of the tour: non-refundable. Under eighteens will always be accompanied by an adult who will be fully responsible.